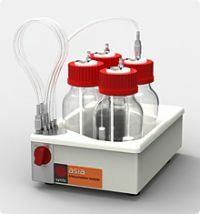 The Asia Pressurized Input Store is designed for use with the Asia Syringe Pump. It holds up to 4 x 250ml reagent bottles (included) under a pressurized inert atmosphere. This not only enables the use of air and moisture sensitive reagents but also assists in delivering an extremely smooth flow by minimizing input cavitation and gas bubble formation during pumping at high flow rates. The bottles provided are plastic coated and are fitted with septum caps enabling air and moisture sensitive reagents to be loaded via a cannula. Outer materials: Aluminium and stainless steel sprayed white with highly chemically resistant epoxy paint. Polypropylene tray.